I like this idea from Mum in the Madhouse . I know, I know. It’s not perfect. Most food banks won’t even be open on Christmas Eve. Poor people need food all year long, not just the holidays. Both totally true. BUT one could certainly adapt this idea to work better w/ the food bank schedule. Or even give it to a family you personally know who might be in need! This would be a wonderful thing to do year round. Maybe during the summer months food could be kid- friendly to offset the loss of school meals? Whatever food bank you’re donating to, ask ahead of time what they need the most of. It’s good to think about other non-food items,too…. toilet paper, feminine hygiene supplies, razors,toothpaste,etc. Next Next post: No Food Wasted: Half a cabbage+kidney beans+leftover tomato soup = …. 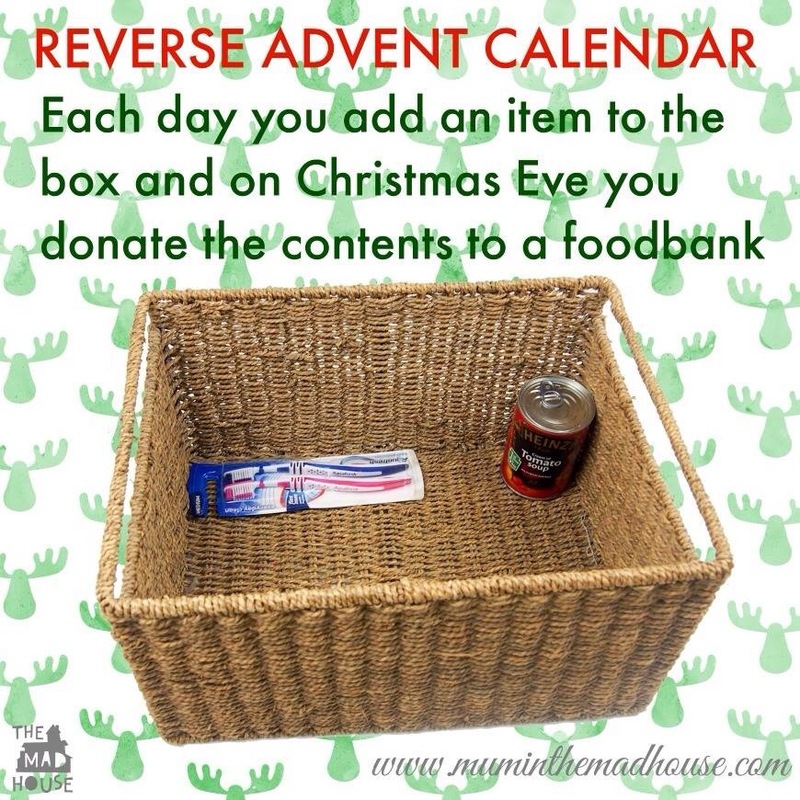 This is a perfect way to make Advent practical. Thanks! I love this idea. I just found out that Hopelink (they do wonderful things year round for our community) closes for the last THREE WEEKS OF DECEMBER. It’s so they can organize/work on their Christmas donations and stuff, but not only is it holidays, but kids are out of school (no free lunch/breakfast). I’m lucky to live in a pretty awesome neighborhood. We have a couple Facebook groups that focus on taking care of each other (giving things away free, hiring people for odd jobs, etc). And helping those in need. Many grocery stores ran a promo in the week before Thanksgiving. If you spent $150 or more you got a free turkey. Many of us were either headed out of town or already had turkey or prefer other brands. I know that just in that Facebook group, 16 turkeys were given to families who would go without for the holiday. As much as social media drives me NUTS, there is some good that comes out of it. Like this idea. A few days late, but I know what I’m doing the next few weeks!